You may have heard of Guts.com’s innovative online casino, but did you know this fresh new gambling firm also runs a comprehensive sportsbook? With thousands of betting markets every day and a wide array of international currencies accepted, Guts Sports offers plenty for desktop and mobile punters in the United Kingdom, North America, Australia and all over the world. 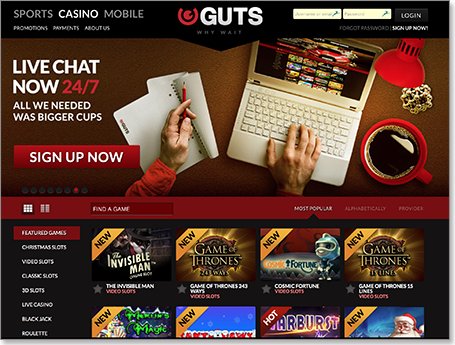 The Guts brand is synonymous with sleek, user-friendly design, and its online sportsbook platform sets an example that all betting websites should strive to emulate. For whereas many bookies fill the screen with spammy ads and too many subsections, there is no clutter to speak of at Guts. The homepage is easy to navigate, with a simple side bar showing the available sports and the number of markets available in each. You can also limit the range to events starting within the next two, eight, or 24 hours. The betting slip is clearly displayed in the top-right corner, while a handful of quick links make it easy to switch from the main betting page to the live scores and statistics sections. We’ve reviewed our fair share of online bookmakers, but this might just be the easiest one to use. If knowing where you are and how to get around at all times is a high priority, we thoroughly recommend Guts.com Sport. While Guts doesn’t have any dedicated betting apps that we know of, it does run a very convenient mobile site which is optimised for all Apple iOS, Google Android and Windows Phone devices. Much like the Guts mobile casino, it is built on an attractive HTML5 interface which allows for quick and easy navigation through all major betting markets. A compact and convenient toolbar gives you instant access to popular events and live odds, and you can even locate specific markets via the in-site search engine. If you prefer gambling through mobile applications, just head to Guts.com on your smartphone or tablet device and use the ‘Add to Home Screen’ function to create a Web app. Within seconds you will have a one-touch thumbnail link that looks and works just like a market application, so you’ll never have to load up through the Web browser again. While most sports betting sites reward their new customers with free wagers, Guts is one of the few trusted online bookies to run a fully fledged cash bonus promotion. Just sign up and make your first deposit, and you can claim a 100% match bonus up to $100. This works much like a standard real money casino bonus. For example: if you deposit $50, you will get another $50 on the house for $100 credits in total. And if you were to deposit $100 or more, you would get the maximum $100 bonus on top of your original cash amount for $200+ credits. But whereas online casino bonuses often come with extensive wagering requirements, the Guts.com welcome package only asks you to play through your total starting balance five times before you can cash out. So if you deposit the $20 minimum and get $20 bonus money, you only need to bet $200 (5 x $40) before you are eligible to withdraw your winnings. For more information, you can read the full terms and conditions at www.Guts.com. Like so many of the most respected online gambling sites, the Guts sportsbook is fully licensed by the Malta Gaming Authority — one of the tightest regulatory jurisdictions for Internet betting. It adheres to the strictest anti-fraud practices and uses a certified SSL (Secure Socket Layer) encryption to provide your funds and your account information with the highest level of protection possible. All the best Internet bookies pride themselves on providing first-class customer service to all punters, and Guts is no exception. The ‘Help’ tab next to your browser’s scroll bar contains a number of useful support tools, including live chat for instant 24/7 assistance. You can get in touch via email if you prefer, or arrange a phone call for matters which require more detailed explanation. There’s also a heap of handy FAQs and quick links to help you troubleshoot any problems on your own. Why bet online with Guts.com? We at SafeBookies.com only recommend 100% secure, licensed bookmakers which offer great products, excellent customer service and competitive prices across a broad spread of markets. Guts Sports ticks all of those boxes, and then some. The standout feature, in our opinion, is the desktop gambling interface. It’s got all the essential bits and bobs, it looks terrific and, most of all, is ridiculously easy to use. We also love the extensive range of live betting options, while soccer fans will revel in the wealth of football props and head-to-head markets from all over the globe. So for hassle-free sports betting all day, every day, wherever you are in the world, sign up at www.Guts.com and score up to $100 bonus cash on your very first deposit.